I read the email aloud to my husband with growing dismay. Staying in Avignon, France, on our own as a prelude to boarding the Viking Delling with Viking River Cruises and cruising the Rhone River for their Portraits of Southern France cruise, we learned that we would not be cruising anywhere anytime soon. River cruising in Europe is one of the most wonderful ways to see the individual countries but, sometimes, when the snow in the Alps is especially deep and melts into the Rhone River in the spring, it means the river is too high for cruising. Because the river cruise ships in Europe have to navigate low bridges and locks, high water means no cruising. 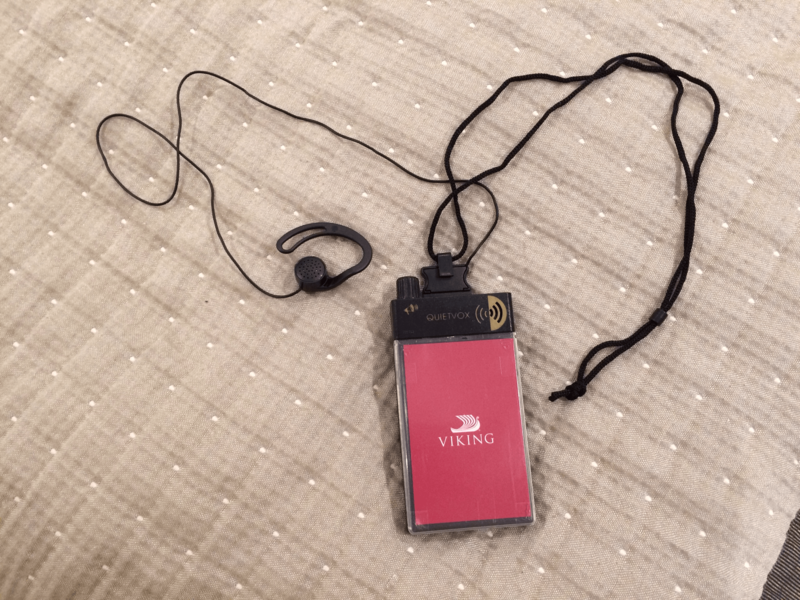 Though we ended up not actually cruising the Rhone, not the ideal scenario, the situation was handled professionally by Viking, as they made the best effort to transport us to every location we had planned to visit and to help us have the first-class experiences we had planned. We were instructed to check in at the Hotel Novotel Avignon Centre, where we would spend the first two days of our cruise, hoping the river would subside enough that the Delling could cruise to us from Lyon. This was not the first two days we had imagined, since we were planning to be in our lovely verandah stateroom by this time, but the hotel is contemporary, comfortable and conveniently located right outside the medieval walled city of Avignon, where we had planned to begin the cruise and tour. That night, we had dinner in the hotel restaurant where we met the Delling crew for the first time. They shared the plans for the next couple of days and their hope that we would be able to board the ship soon. We never blamed them for our misfortune, as they were just as dismayed as we were and equally anxious for us all to get on board. They were charming, friendly, helpful and determined to make sure every passenger had a great experience on the trip. We were very impressed with their dedication and never changed our opinion during the entire week we were with them. Assume the cruise was a no-go, leave and receive a refund for the cruise. Stick with them, hope the river would lower, and they would get us to the scheduled destinations by motor coach. A very few people took Viking up on the refund, but most stayed, hoping the river would go down and the cruise would resume at some point. Unfortunately, this proved to be a vain hope as the river levels never subsided enough to cruise the Delling to Avignon to pick us up. However, we spent the next day, what would have been our first day on the cruise, touring the charming city of Avignon, and it was a wonderful beginning to our trip. Avignon is a UNESCO World Heritage site located in southeastern France on the left bank of the Rhone River. With cobblestone streets, plenty of outdoor dining at the area cafes, and shops selling a myriad of products made from the lavender which is prolific in the Provence region, it’s a fascinating place to visit. Surrounded by an ancient stone wall which really makes you appreciate the fortifications needed to defend a city in those days, the city has one of the most visited monuments in France, the Palais des Papes. 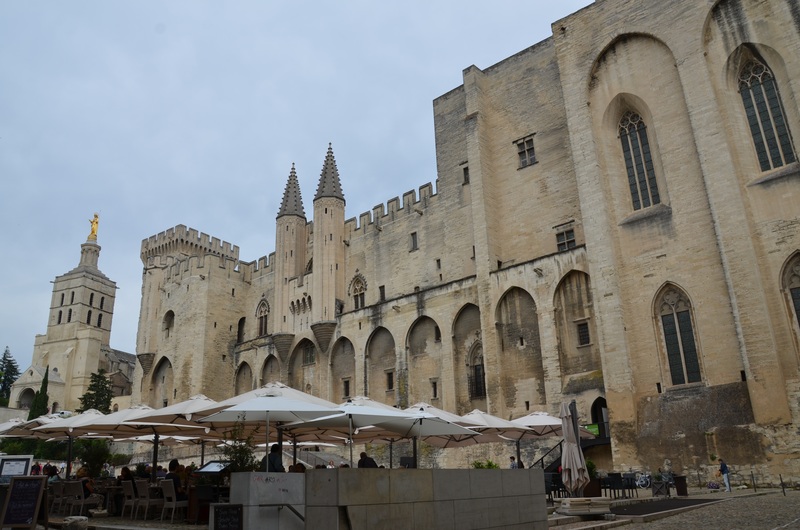 A tour of the Palais de Papes gives you an appreciation of the time, effort and man hours required to build this amazing edifice. Avignon became the papal residence under Pope Clement V in 1309. His successors made it the capital of Christianity and transformed what had been a palace into the still standing Palais de Papes. The International Gothic style of the palace was impressive, and the papal library was equally impressive, being the largest in Europe at the time. With walls 17-18 feet thick and built on a natural spur of rock, many buildings in Avignon are built, rather astonishingly, right into the existing rock, it was nearly impregnable to attack. Captured during the French Revolution, it was used as a barracks and prison for many years; the soldiers and prisoners caused further damage to the structure, prying off parts of statues and pieces of irreplaceable murals to sell. We were thrilled to hear that night that we would finally be boarding the Viking Delling after a bus ride to Vienne, where the ship had managed to cruise from Lyon, although it could not cruise to Avignon to pick us up. After finally boarding the ship, we soon fell in love with our new home away from home. We were welcomed by the crew, who I’m sure were just as happy to have us on board as we were to be there, and we began exploring the ship. The Viking Delling is a gorgeous Viking longship with lots of light colored wood, open areas with plenty of large windows and comfortable seating and very nice staterooms. We were in a Verandah stateroom, which was like a very comfortable hotel room complete with a flat screen television, free movies on demand and a perfect little verandah for watching the river and the scenery. The open airy atrium lobby is one of the classiest areas on the ship and your first introduction as you enter. On the top deck is an organic herb garden and solar panels, a small putting green and a walking track. There is an elevator available from the middle to top deck and Wi-Fi throughout the ship, although it was pretty spotty in our stateroom and we had to go to the library to actually use it. 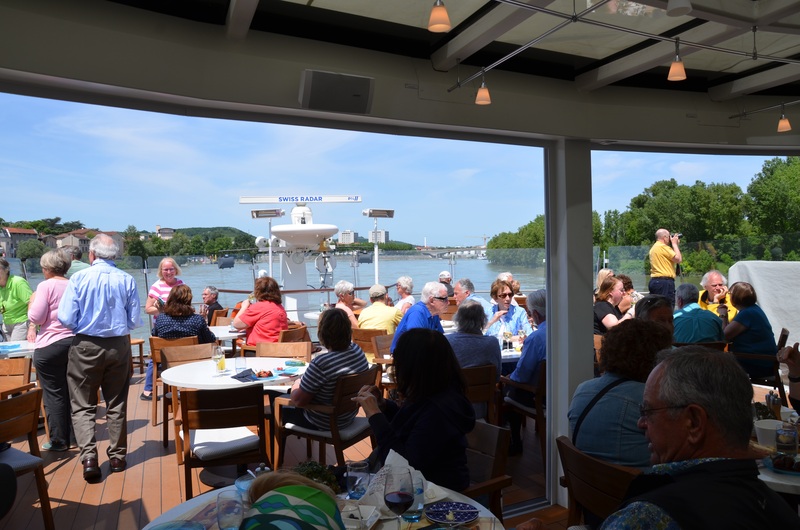 One of the nicest areas on the ship and one that is unique in river cruising is the Aquavit Terrace, an open-air restaurant on the bow, with plenty of seating in sun and shade where you can order a casual meal or partake of a buffet. We had several meals there and it became one of our favorite places. All our meals, whether eaten on the Aquavit Terrace or the lovely dining room, were wonderful, a true gourmet experience. 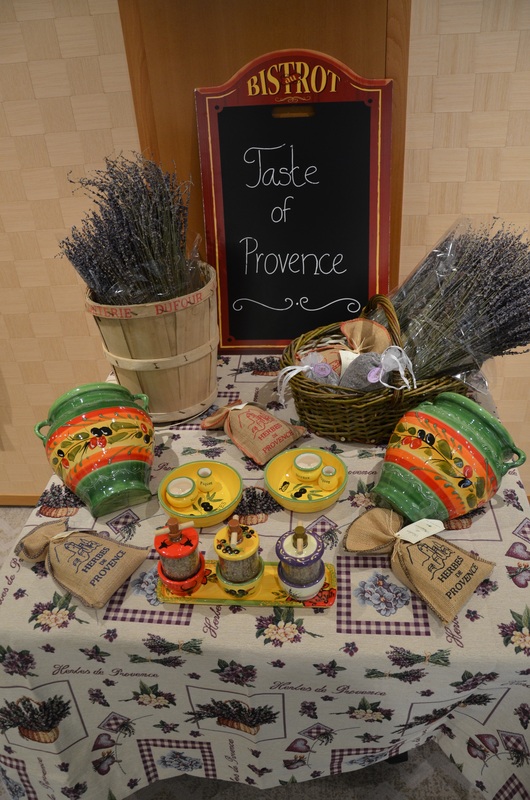 We even had a lunch one afternoon with a focus on the cuisine of Provence. Everything from an extensive buffet and local wines to a chocolate fountain and scrumptious macaroons were provided. Traditional French dishes served other nights — like frog legs and escargot — were popular with guests as well. Wine, beer and soft drinks were included at no charge at every meal. 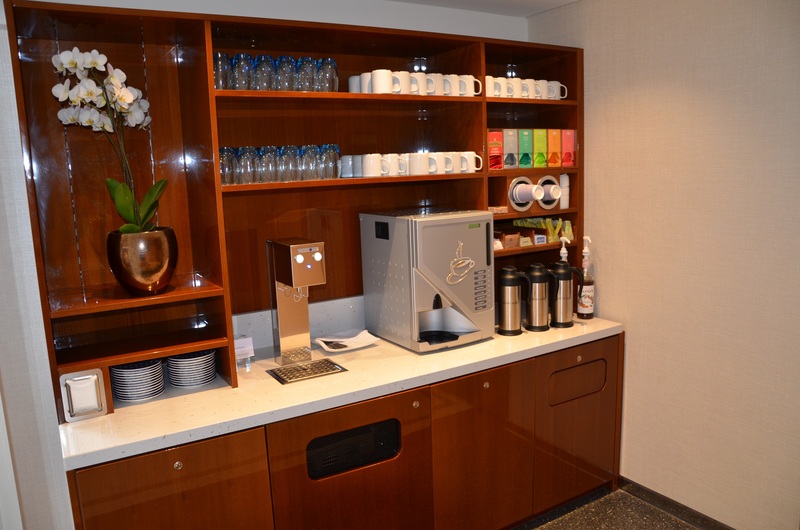 Coffee, tea and light snacks were also available at any time; in addition, there was a cash bar in the lounge area. Shore excursions are all included in the price of the cruise and, because everyone is given a headset, it’s easy to hear everything the very knowledgeable guides have to share, no matter where you are in group. After boarding in Vienne, we did the only true cruising of the week as we journeyed to Lyon, where we docked for the rest of the cruise. From there, we journeyed to the sites which had been planned for the cruise. Since we were docked in Lyon, we were able to explore the city in a leisurely manner on our own, but we also experienced a guided tour there, as we did in all the other locations on our itinerary. I’ll go into more detail about the rest of our experiences in another, more detailed article, about the other towns we visited but suffice it to say, that although our cruise was not the experience we had planned, it was still a wonderful experience in every way. If you are thinking about taking the same cruise, check out this video and make your plans!